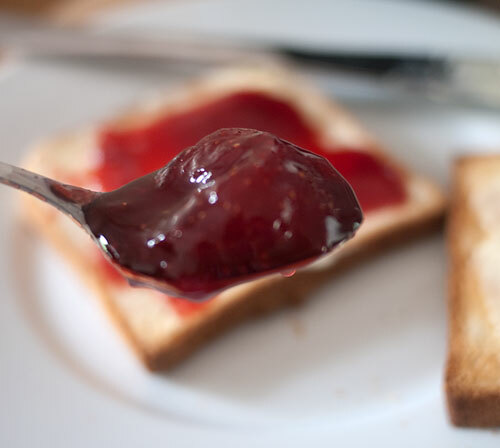 I've left it until rather late in the season, but here is a recipe for a a very basic yet utterly delicious strawberry jam. 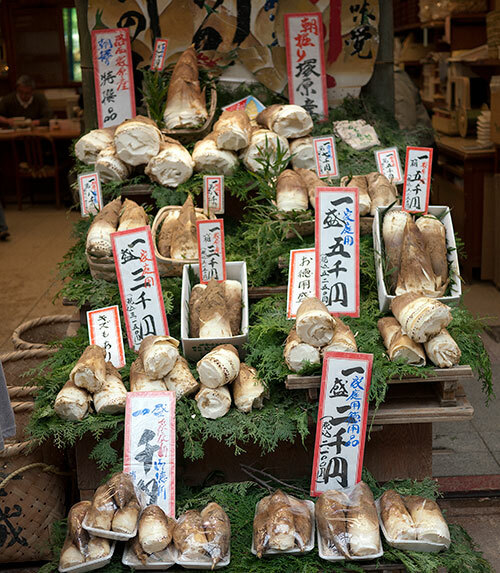 A new article in the Japan Times about bamboo shoots, a quintessential springtime vegetable. 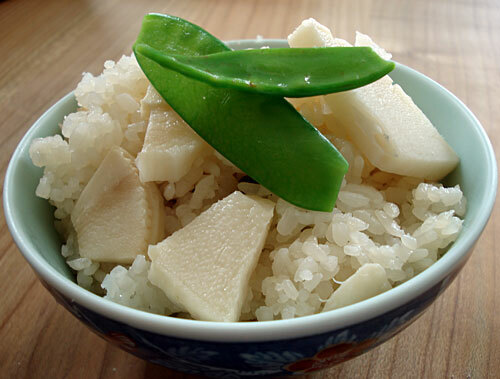 This month's Japanese Kitchen column in the Japan Times is about a quintessential early spring vegetable called nanohana. There's even a very well known children's song about it. 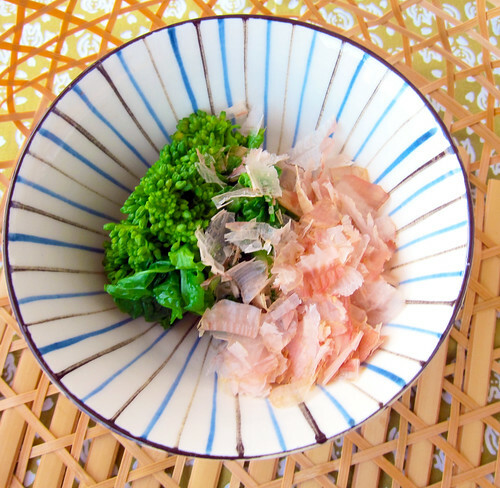 My latest article in The Japan Times is about edible cherry blossoms and leaves. 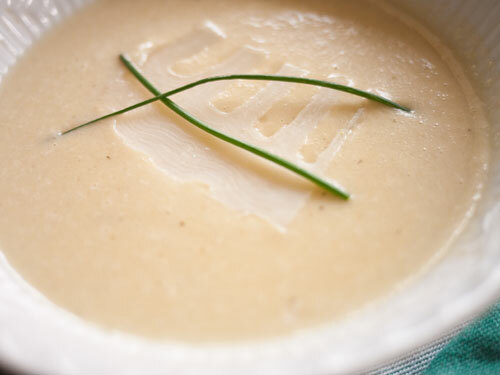 A very simple creamy soup, made with a quintessentially Japanese spring vegetable, bamboo shoot or takenoko. I will get back to my Kyoto Postcards, but I wanted to talk a little about cherry blossoms first, before April ends. 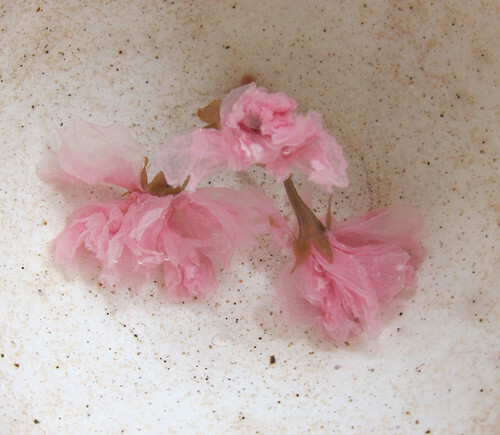 I have written about the ohanami, or cherry blossom viewing, culture in Japan previously. 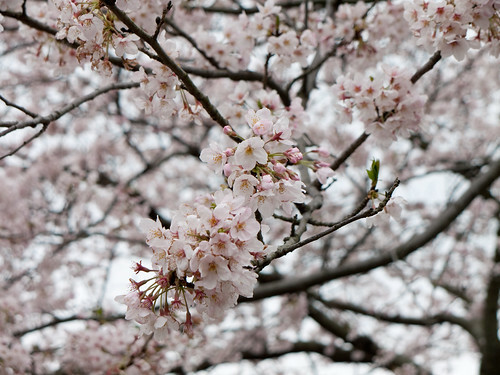 As I wrote back then, one of the things I miss about not living in Japan is the cherry blossoms in the spring. For this trip back home, I wanted to be sure not to miss the cherry blossoms. It seems that quite a few people have been trying out the kasutera/castella recipe recently, and running into problems. Castella is not an easy cake. So, since it's Easter, I thought I'd haul this out of the archives attic. These little 'rich tea cakes' are much easier to make, and while they have an entirely different texture they are really quite delicious. I hope you'll give them a try! 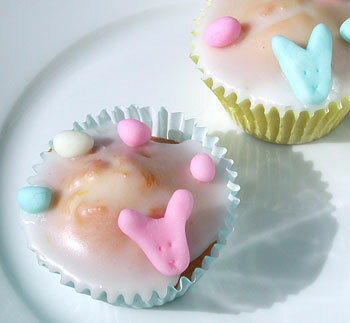 The fondant is not too hard if you can get a hold of the glycerin, but alternatively you could use store bought Easter themed cake decorations. 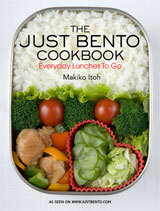 Originally published in March 2005, as part of the late lamented Is My Blog Burning food blog event. From the archives, originally posted March 2, 2007. These delicately colored sushi are a great way to use __usuyaki tamago__. I know I've been re-posting things from the archives a lot lately, but I hope you'll forgive me - I'm moving tomorrow! In any case, I hope you'll give these delicate sushi a try, especially if you have daughters or granddaughters. The 3rd of March is Momo no sekku or Peach Day in Japan. Peach blossoms usually start blooming around this time, signifying the coming of spring. It's also the day for _hina matsuri_, the Doll Festival or Girls' Festival. Households with daughters display hina ningyou-, traditional dolls that represent a princess's wedding procession. This is because the ultimate happiness expected for a girl was for her to make a fruitful and comfortable marriage. Nowadays girls may be expected to do other things besides become happy wives, but on this day at least traditions still hold strong. In Japan there is a long standing stereotype that girls and women like very sweet things, while manly men like less sweet and bitter things. So, for Hina Matsuri the guests are served sweet things like amazake (a very thick non-alcoholic hot drink made from the lees of sake, rather like eggnog in color and cloying sweetness), hishimochi (tri-colored mochi cake) and okoshi (colored sweetened puffed rice). Although there were three girls in our house, none of us liked amazake at all. 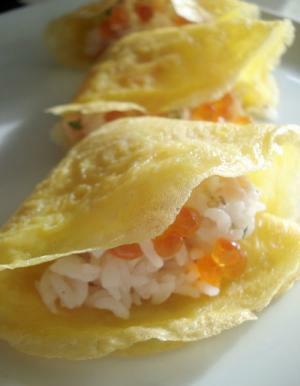 However, my mother often made some kind of sushi for Hina Matsuri, which we really loved. Here are two kinds of very pretty, girlie sushi in feminine pink, yellow and white with a touch of green. These colors fit the theme of Hina Matsuri perfectly: the traditional hishimochi is colored white, pink (or light red) and green. It may surprise you to read this, but I do not actually miss living in Japan that much generally, except for my family and the food. My home territory there is the greater Tokyo area, and while Tokyo is a great metropolis, it's also unbearably congested and you are living on top of other people all the time. To borrow a term used for another place in the world, generally speaking it's a nice place to visit, but I'm not sure (given a choice) that I'd want to live there. But there are certain times of the year when I do wish I were there, and right now is one of them. It's cherry blossom time.